When I was six, thousands of large, black, ants suddenly covered the floor of my bathroom. I have been fascinated by ants ever since. So at the outset, there was a certain amount of bias toward any book about them. Given this, Adventures Among Ants by naturalist Mark Moffett met expectations and when the story was all told and done, answered just about every question anyone could ever have about ants—and then some. 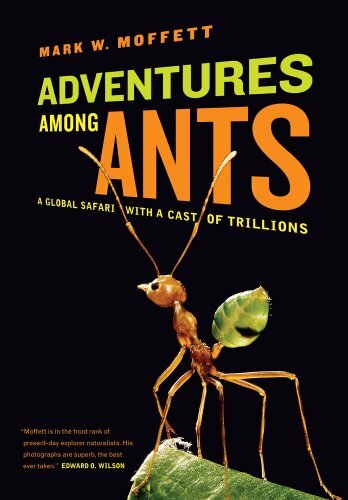 “A Global Safari with a Cast of Trillions” is the book’s subtitle, and true to its words the reader is taken around the world on a fascinating tour of ant colonies and societies. It’s a Ph.D. in myrmecology. And, not satisfied with just describing the fascinating things ants do, Moffett shows us the most fantastic, macro photos of ants you will ever see, also featured in National Geographic over the years. Make no mistake. This 280-page tome about ants is all about studying and learning about ants and ant behavior in an exhaustive manner. In addition, the book is as upbeat and cheery as it is illuminating. Adding to the sense of wonderment, the author captures plenty of adventures as ants cut leaves, wage fierce battles, engage in ritual combat, make ingenious tools, and use insects and other ants as slaves. Adventures Among Ants has so many layers. First, Moffett demonstrates that ants are incredible organisms, diverse and varied and very organized. He lifts the curtain on ant life and lets us see several societies of them, from scary, omnivore marauder ants to fungal farming, leaf cutters. The contrast in lifestyles and behavior is astonishing, and there are new ant facts in every paragraph. On another level, the book shows how a naturalist researcher goes about the business of making scientific discoveries, setting up experiments, observing and gathering data, and reaching conclusions. Moffett, who is a research associate at the Smithsonian, walks us through several of his own discoveries. Then there is the metaphysical level. Yes, ants can provoke thoughts about life, especially human life. Are they individual animals or is the whole colony necessary for ant life? Do they think or is their incredible organization and individual purpose just instinct? Adventures Among Ants will leave you thinking about our own societies. Then there are the pictures. Moffett invented a special camera lens and system to take absolutely the most gorgeous, colorful close ups of ants. The pictures are stunning and perfectly punctuate the descriptions of the ant activity revealed in the book. In sum, Adventures Among Ants is a great read. However, it may not be for everyone. There is so much information about ants in this book that is may make your head spin. Still, if you crave information about ants or, better yet, have ever had an ant farm, or have read all of E. O. Wilson’s studies, or have followed ants around for more than one afternoon—then this is a book for you.